Fianna Fáil County Councillor, John Paul Feeley has warmly welcomed the approval of Community & Voluntary Grants to groups across the Municipal District under the 2019 Scheme. This entry was posted in Press Releases on April 22, 2019 by admin. Leaks reported today from the Department of Communications that the National Broadband Plan is to be further delayed at the Cabinet meeting scheduled for tomorrow simply cannot be accepted. It is high time for Ministers who proport to represent Rural Ireland to stand up and demand action. In February as part of an attempt to soften up the electorate for bad news on the NDP we were told it would cost multiples of what was initially thought and the Taoiseach indicated that the Government had to make a final decision as to whether or not it would actually proceed. How many more studies and reports are required, a new Minister who was supposed to sort it for once and for all has made no progress. There are Ministers from the region and indeed around Rural Ireland who appear to forget their constituencies and the needs of Rural Ireland when they walk the corridors of Government Buildings. This entry was posted in Press Releases on April 15, 2019 by admin. Responding to recent media coverage suggesting that Cavan/Monaghan ETB are to prepare a feasibility report on the sites of St. Mogue’s and St. Bricin’s to accommodate required extensions with the aid of external experts, Fianna Fáil County Councillor, John Paul Feeley has called on the Department of Education and Skills to intervene and commission a detailed study of both schools independently. Concluding, Councillor Feeley noted that Cavan/Monaghan ETB is one of three ETBs in the country not to have adopted and published a Strategic Plan. This entry was posted in Press Releases on April 11, 2019 by admin. 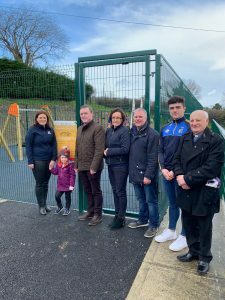 The people of Butlersbridge can be proud of their working in developing a new playground,’ stated Fianna Fáil Councillor, John Paul Feeley who attended the official opening on Sunday last, 10th March 2019. Despite snow showers, the sun escaped the clouds for the few speeches and subsequent blessing by Fr. Brian McElhinney before the first children officially used the playground. Snows showers, wind and cold did not keep a good crowd of local children and adults from attending this special event. The playground is located within the grounds of Pairc Emmet provided by the GAA Club. Concluding, Councillor Feeley acknowledged the many projects undertaken by the local community in recent times. Marking Seachtain na Gaeilge, children from the local school preformed the Hacka as Gaeilge. This entry was posted in Press Releases on March 14, 2019 by admin.